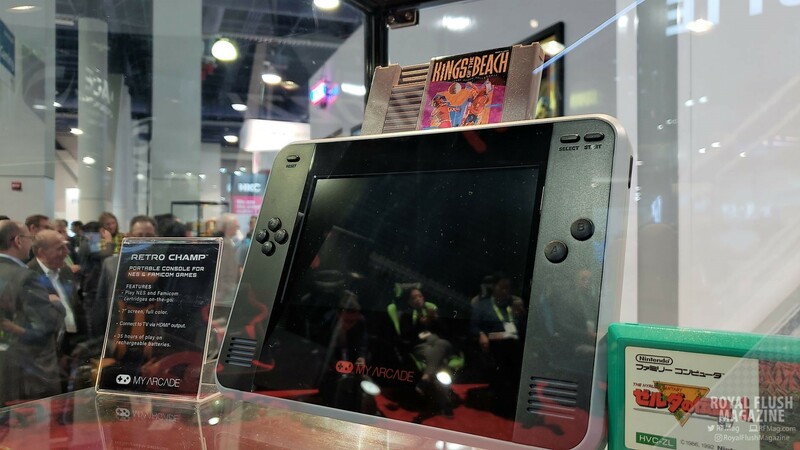 My Arcade continued its campaign to provide retro gaming to retro gamers everywhere with its latest showcase at CES 2019. Making a splash with its Micro Player collection of portable cabinet consoles, My Arcade’s latest partnership with Taito adds more upcoming titles to their collection, such as Don Doko Don and Elevator Action. These Micro Player consoles and more were on full display at CES, along with My Arcade’s latest additions, the Turbo GamePad for the Playstation Classic and the Retro Champ portable NES and Famicom console. Let’s dive into each. 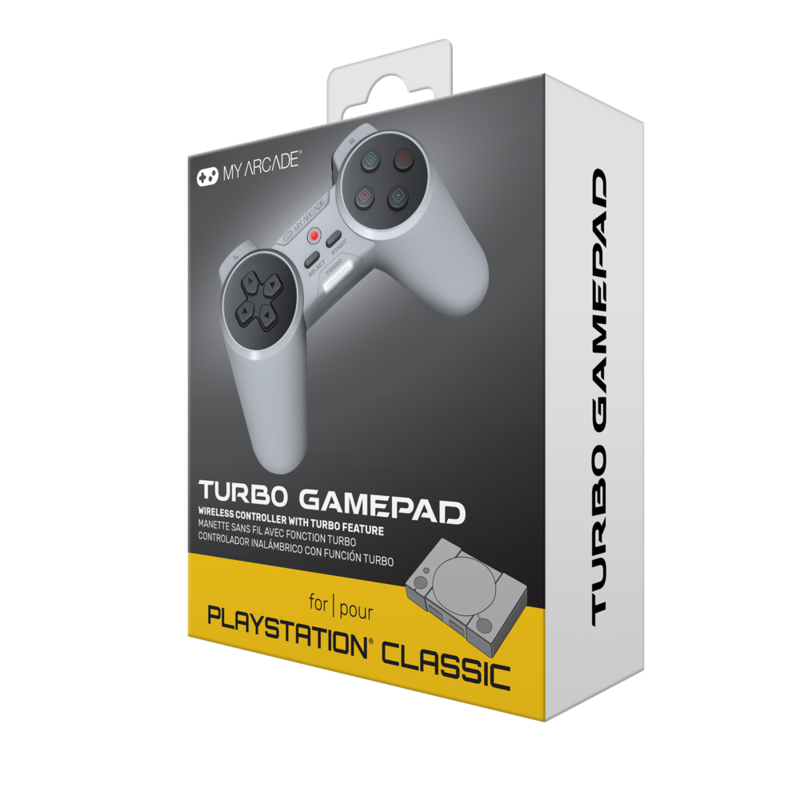 The Turbo GamePad is a wireless solution for the Playstation Classic console, granting you playability from up to 25 feet away. The Turbo GamePad features a button placement and design similar to what you would see on the original Playstation controller, but with improved ergonomics. Its Turbo feature can be assigned to any of the action buttons and uses an LED indicator for displaying button-press status. Also, the controller contains a battery that is rechargeable via a microUSB cable. The Turbo GamePad will be available in March 2019 for $24.99. Check it out here. Have that shoe box of old NES or Famicom cartridges stuffed somewhere and wish that you could relive the good ol’ days while on the go? Well, get ready to show nearby Nintendo Switch users an experience that is much closer to classic gaming than just playing on an emulator. Housing a 7-inch screen and sporting 35 hours of playtime, the Retro Champ is ready to play your NES and Famicom cartridges directly. Featuring the classic D-pad, A, B, Select, and Start assortment of buttons, the portable console slots NES cartridges on through the top and Famicom cartridges through the bottom. Also, blowing those cartridges will stay a thing of the past thanks to a built-in cartridge cleaning kit. 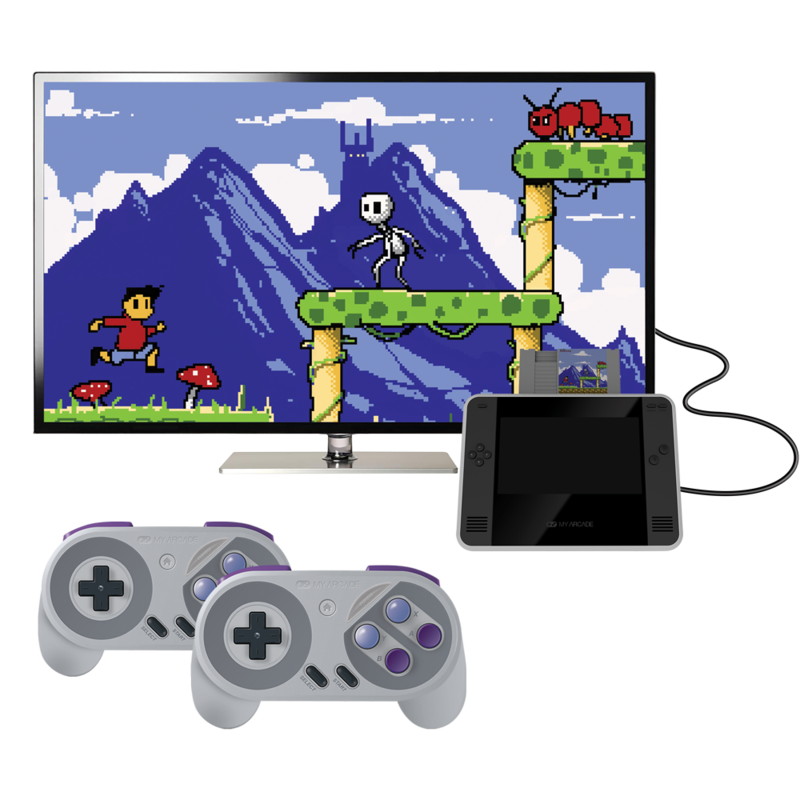 Also built-in is an HDMI out port which combines with the Retro Champ’s built-in kickstand to transform the unit into a stationary home console. Compatible with My Arcade’s Super GamePad wireless controllers, the Retro Champ brings the couch play experience to your home as you play Nintendo classics directly on your TV. The Retro Champ will be available in June 2019 for $79.99. Check it out here. Do you feel that you don’t actually need a Retro Champ? Do you that still have a working NES or Super NES console, but have no way of playing Famicom or Super Famicom games that you happen to have? Well, My Arcade also offers cartridge converters for both the NES and Super NES for retro gamers that want to explore the overseas side of the Nintendo library. Check out all these products and more at https://www.myarcadegaming.com/.